Candidates waiting for admission and counselling process to secure NEET 2019 MBBS seats in government colleges must also keep an eye out for admission procedure of their native state. If you are a domicile holder or native student of Tamil Nadu and seek admission in top state medical colleges, then you can check all the details regarding Tamil Nadu MBBS admission 2019 here. Check Tamil Nadu MBBS counselling 2019, selection procedure on the basis of NEET result 2019 and other Tamil Nadu MBBS admission 2019 details below. Medical colleges in Tamil Nadu offer some of the best medical colleges in India that can help candidates pursue excellent careers in the medical field. Admission will be done on the basis of Tamil Nadu state merit lists and NEET 2019 cut-offs. Tamil Nadu MBBS admissions 2019 will begin soon and application details are given below along with the important dates and eligibility criteria. Candidates must have passed class 12/ HSC/ intermediate/ other equivalent exams either from Tamil Nadu state board or other recognized boards of education in a single attempt. Candidates must have pursued Biology, Physics and Chemistry in Class 12 board or other equivalent exams and they must have secured at least 50% aggregate marks. SC and ST candidates are required to score an aggregate of 40% in the same, whereas, SC-PH, OBC-PH, ST-PH and GEN-PH are required to score 45% aggregate marks. Nativity/ Domicile Holders: In order to apply for Tamil Nadu MBBS and BDS admissions 2019, candidates must possess domicile of Tamil Nadu or must have pursued their school education i.e. class 6 to class 12 from schools based in Tamil Nadu. In case of the latter, candidates do not need to submit domicile to claim admission under the 85% state quota. Nationality: Candidates applying for Tamil Nadu MBBS admissions 2019 must be citizens of India. OCIs are also eligible to apply for Tamil Nadu MBBS and BDS admissions. Age: The state of Tamil Nadu expects all applicants to be 17 years old by December 31, 2019, in order to be eligible for admissions in state medical colleges. Filling the application forms will not confirm participation in Tamil Nadu MBBS counselling 2019. Candidates will have to complete the document verification round successfully in order to ensure candidature. Candidates will have to qualify three stages in order to clear the Tamil Nadu selection process for admission to MBBS and BDS colleges in the state of Tamil Nadu. The first stage is clearing NEET 2019 exam and the cut-off set by CBSE. The next stage is applying for admissions and getting the documents verified. The third and final stage Tamil Nadu MBBS selection process is the counselling and seat allotment on the basis of state merit list. Candidates who clear all these three stages and confirm admission at the allocated colleges by paying the admission fees will be able to begin their MBBS or BDS course from August 1, 2019. Check Tamil Nadu NEET Merit List 2018 for Government Quota Seats here. 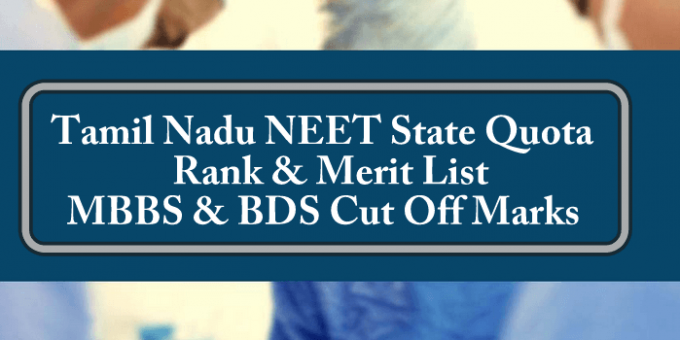 Check Tamil Nadu NEET Merit List 2018 for Management Quota Seats including NRI here. In order to get their preferred colleges and courses, candidates will have to fill their preferences once they have cleared the document verification round and their names appear in Tamil Nadu MBBS merit list. Seats will be allocated on the basis of availability of seats as well and candidates will be alerted about the counselling procedure on their registered mobile numbers and email IDs. Candidates are advised to carry the required documents and a few photocopies in order to take provisional admission on the basis of Tamil Nadu MBBS counselling 2019. Candidates who get seats will be able to download their call letters from the official website of Tamil Nadu admissions 2019. These call letters will be essential for securing seats at the allocated colleges in order to verify the student details. MBBS is one of the most recognized medical degrees in India and there is a lot of scope after pursuing MBBS. Native candidates have a better chance of securing seats in Tamil Nadu MBBS admissions and securing a bright career in the medical field. Stay tuned with Cbseneet2019 for more updates regarding admission in Tamil Nadu medical colleges.